Welcome to the magic show, but this ain’t no magic trick. 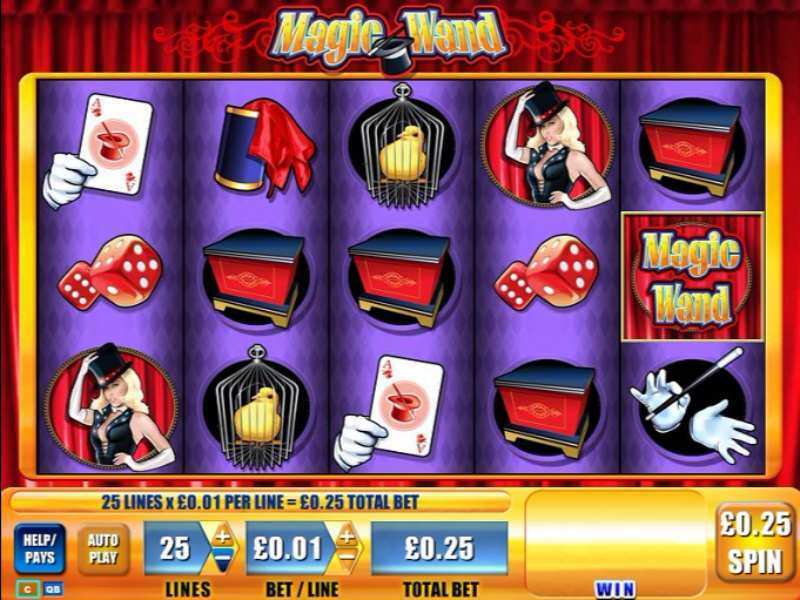 With a single swing of Magic Wand you can win some of the amazing rewards that this slot involves. Published by the software developing company WMS, here comes the classical slot that is featuring 5 reels and 25 ways to pay out gamblers winning combinations. Theme is based on a magic show so the imagery contains all the magician stuff. You don’t have to practice, just spin the reels and pull out the rabbit out of the hat that brings you opportunity to hit the jackpot. So in the slot you are going to come across wands, red curtains, daces, magic cards and other things. The background behind the reels is completely black, so there is nothing to distract the players making it easier to focus on the actual game. Graphic design is classically made similar to other WMS slots, and animations are a casual thing as well. The interface is made to fit in the picture, and it involves buttons with different functions. The sounds are rare and they appear only when gambler makes a win. The red curtains are lifting and the show can begin. The imagery is presenting all the necessary magician tools to make a final trick, and hit the jackpot. Poker cards, chains, magic boxes, dices are all going to make that come true. To make it easier you are even given an assistant. All of the mentioned symbols belong to the regular group of cards. The most valuable one is a powerful magician that is casting magic, along with a women assistant. When 5 of them are landed at the same time, player receives highest regular win worth 7.50 credits. The magician and assistant are being followed up by less worthy symbols such as chain locks, caged bird, dices, cards, and boxes. The regular gameplay is played out by the same rules as in other slots. The winnings combinations are formed from the left to the right and the first symbol has to be on the first reel. When couples of combinations are made simultaneously, only the highest one is going to be paid out per bet line. The true magic of the Magic Wand slot’s gameplay hides in the special group of cards which involves Wild and Feature symbols. The scatter card which is a usual sight is not involved in this one. Pull out the magic wand and cast the special magic effect which the wild symbol is carrying. It substitutes for any ordinary symbol to form the winning combination allowing the player to have more chances of completing them. Besides the effect, the wild card is the most valuable symbol. Land 3 of them and win 1 credit. Land 4 and win 7.5 credits. By landing maximum number of 5 wild cards, gambler receives 25 credits. What would a magician be without his magic hat? Nothing of course. All of the magic comes from the inside of the hat. It presents the Feature symbol which unlocks free spins mode. That effect is activated only when the player lands the minimal number of them at the same time on the reels, which is 3. You can win up to 20 free spins thanks to this! While the machine spins on its own, 2 of the reels are going to turn wild randomly. During this feature, if the player is enough lucky to land 3 or more feature cards again, spins are going to reset. The free spin mode ends when the player isn’t landing feature symbols anymore. The betting levels in Magic Wand online are ranged and optimized for everyone’s pockets. The max amount of coins that can be placed per bet line is 3. By putting 3 coins on all 25 paylines, the player achieves maximum bet amount which is 75 coins. For the ones that like to play it safe, the minimum bet amounts 0.25 coins (0.01 per 25 lines). Return to the player percentage is 96%, and that means that gamblers can expect constant wins! 0 responses to "Magic Wand Slot"